I’m pretty sure talking about salad is a first for me here. Don’t get me wrong, I love salad. The closer the warm weather gets, the more often I’m in the mood for one. But I don’t usually have a recipe. Like my soup, whatever sounds good gets dumped together and called a meal. Trust me, it’s more appetizing than it sounds. This salad came after a trip to Costco. I had a bunch of ingredients that suddenly sounded delicious together and, for once, I actually kept track of everything I put in just in case I wanted to repeat it. At this point, I’ve made it many times, so it’s time to pass it on as a tried-and-true recipe. 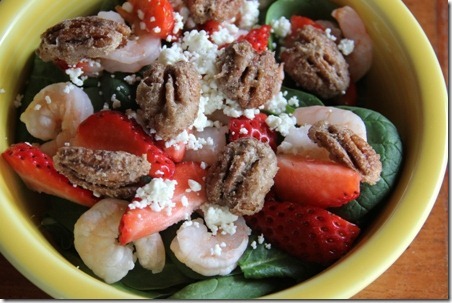 For me, the star of this salad is the sugared pecans. They need to be made ahead of time, because they reach their crispy peak when they’ve cooled completely. Combine sugar and water in a saucepan. Cook over medium heat until sugar has dissolved and the mixture bubbles. Stir in the pecans. Pour onto a greased baking sheet, spreading the nuts out as much as possible. Cook at 350 degrees for 15 minutes, stirring once halfway through cooking time. Keep an eye on them as they near the end of the cooking time so they don’t burn. Pour onto waxed paper and cool completely. Store in an airtight container. 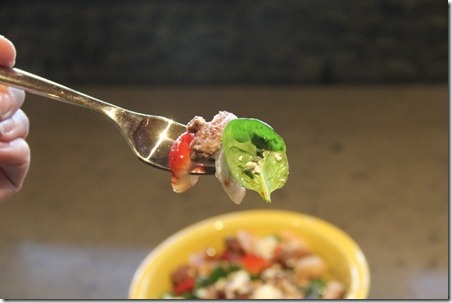 The next component that gives this salad its character is the dressing. It’s fairly strong, so a little goes a long way. Combine all ingredients in a shaker or jar and shake until combined. Shake again before each use. I’ve tried both blue and goat cheese and they were both delicious. I love shrimp in this, but if you’re not a fan it would also be tasty with chicken, or no protein at all. This is a perfect bite, with a bit of each ingredient. My new favorite lunch. And while we have some amazing strawberries in Oregon, thank you to California for sending some long before I can pick them here. You’re my hero.